The Unversed equivalent of a Shadow. Agile, but otherwise unimpressive. The Flood is an Unversed that is found in Kingdom Hearts Birth by Sleep and Kingdom Hearts III. It is the most common form of Unversed. Floods tend to be the first Unversed to appear whenever, Terra, Aqua and Ventus visit a world. In Enchanted Dominion, a group of Floods attack Terra as soon as he arrives. He slays all but one, which he chases to a bridge leading to King Stephan's castle. In Castle of Dreams, Floods are attracted Cinderella's despair after her ballgown was ruined by her wicked step-family. Terra later spots some on the balcony above the ballroom. In Dwarf Woodlands, Floods appear and scare Snow White into the forest, leaving Terra to dispatch them. In Radiant Garden, a swarm attack Terra upon his arrival, confirming that Vanitas is there. Some later chase a young Kairi, prompting Mickey and Aqua to team up to get rid of them. Aqua finds them upon her arrival in Deep Space. At the Keyblade Graveyard, Floods are among the many Unversed summoned by Vanitas. He uses three of them to bind Ventus, so he force him to merge back together, creating Ventus-Vanitas. Floods appear in the lobby of Monster's Inc along with Spike Turtles, much to Sora, Donald, and Goofy's confusion, as they are not familiar with the Unversed. Goofy later remembers that Yen Sid had warned him about them, and that it had been a very long time since they appeared. Floods are seen entering doors to scare children and collect the energy from their terror. The Flood is a sleek, humanoid creature with blue skin. Its arms and legs end in points and have no distinct digits. It has a triangular head with two long, jagged, lightning bolt-shaped antennae reminiscent of the Unversed symbol. Its red eyes are set in an angry expression, and it moves in a jerking, twitchy motion. While most Floods are roughly the size of a Shadow Heartless, some in the Keyblade Graveyard are shown to be quite large. It is the only generic Unversed that does not have an Unversed emblem on its body. Like all Unversed, the Flood is created from a negative emotion; the Flood is a monument to the sin of "irritation". 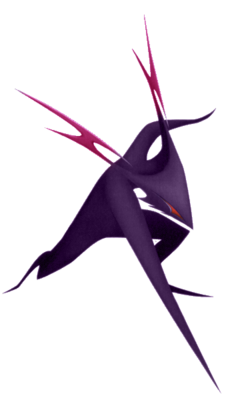 In Kingdom Hearts Birth by Sleep Final Mix, the Flood receives a palette swap which gives it a purple body and fuchsia antennae. Interestingly, the Flood's behavior mimics that of a Shadow, the basic form of Heartless[please confirm], and a Dusk, the basic form of Nobodies. Like Shadows, the Flood is able to sink flat into the ground and become temporarily invincible. Like Dusks, a Flood's body stretches and contorts when it spawns. A "flood" is an overflow of an expanse of water that submerges land. This could refer to the danger Floods pose in great numbers and their blue coloration, as well as "overflowing emotion". The Flood has a similar fighting style to a Shadow Heartless. It sinks into the ground to avoid damage and attacks enemies with its claws. The player can easily defend against a Flood's attack by watching for it to wave its arms just beforehand. Although very weak, Floods can be quite a menace when they appear in large groups. While they often appear alongside larger Unversed, it only takes a few hits from the Keyblade to destroy them. It is also possible to use magic in order to defeat this enemy. If a Flood sinks into the ground, simply wait for it to surface before attacking. Cut Apart (切り裂き, Kirisaki? ): Strikes the player with its claws. Dive Thrust (ダイブ突き, Daibu Tsuki? ): Sinks into the ground to avoid damage. A Flood as it appears in Kingdom Hearts III. Concept art of the Flood. This page was last edited on 14 April 2019, at 23:50.